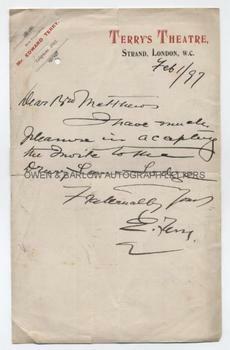 EDWARD TERRY autograph letter Signed. ALS. 1p. Terry's Theatre, Strand, London, W.C. February 1st 1897. To Mr Matthews. "I have much pleasure in accepting the invite to the Drury Lane Lodge, Fraternally yours. . . [etc]". 8vo. Approx 8 x 5 inches. Small filing hole in top left corner, one short edge tear at top edge just touching the top of the 'T' in 'Terry' in the printed address. Slight creasing. Very good. Edward Terry was the illegitimate son of the Irish Chartist leader, Feargus O'Connor. With the young Henry Irving he made several provincial tours, rapidly rising to become one of the leading actors of the 19th century. He was a fine comic actor, reaching his peak with John Hollingshead's company at the Gaiety Theatre. Edward Terry opened Terry's Theatre in the Strand in 1887. Edward Terry was the patriarch of the famed Terry dynasty of actors and actresses that include Ellen Terry, Fred Terry, Edward Gordon-Craig and Julia Neilson.